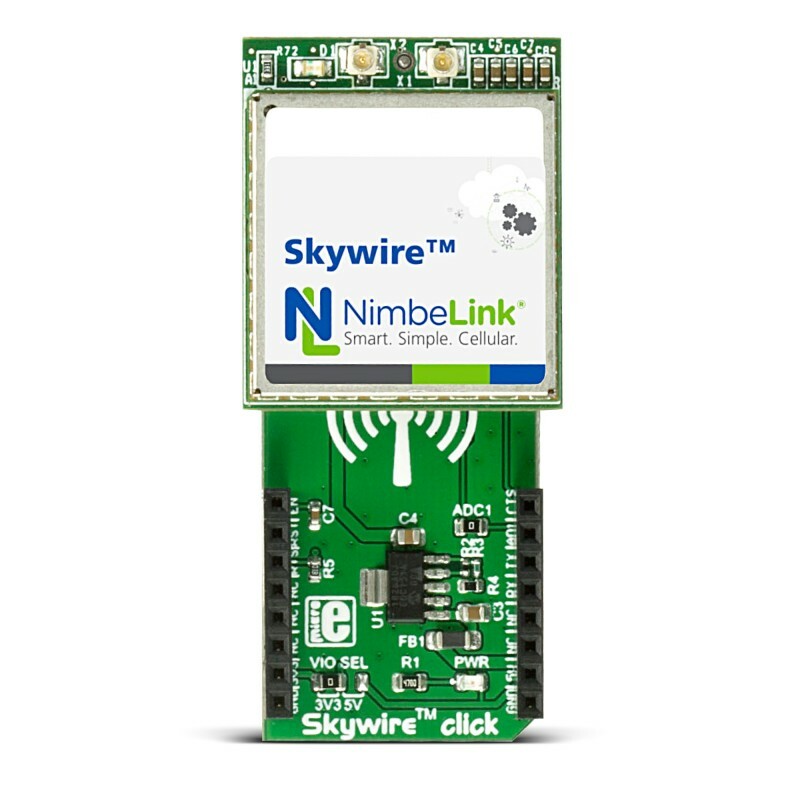 Skywire™ click is an adapter click, which hosts NimbeLink/Skywire ™ cellular modems (using stacking headers) to MikroElektronika development boards. It carries the MCP1826 low dropout regulator from Microchip. NOTE: the Skywire ™ modem and the Thermo 3 click are not included in this offer. 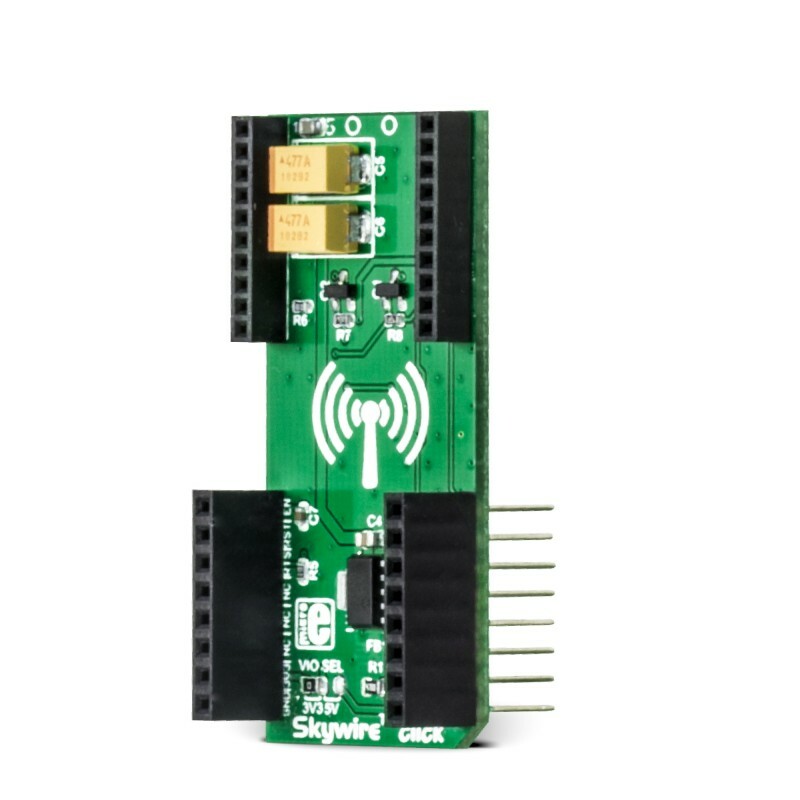 Skywire™ click is an adapter click, which hosts NimbeLink/Skywire™ cellular modems (using stacking headers) to MikroElektronika development boards. It carries the MCP1826 low dropout regulator from Microchip. 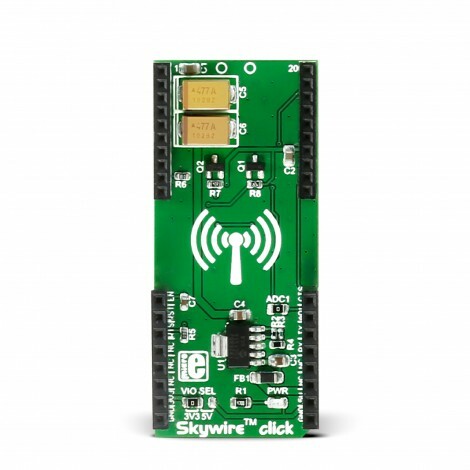 Skywire™ click is designed to run either on 3.3V or 5V power supply. 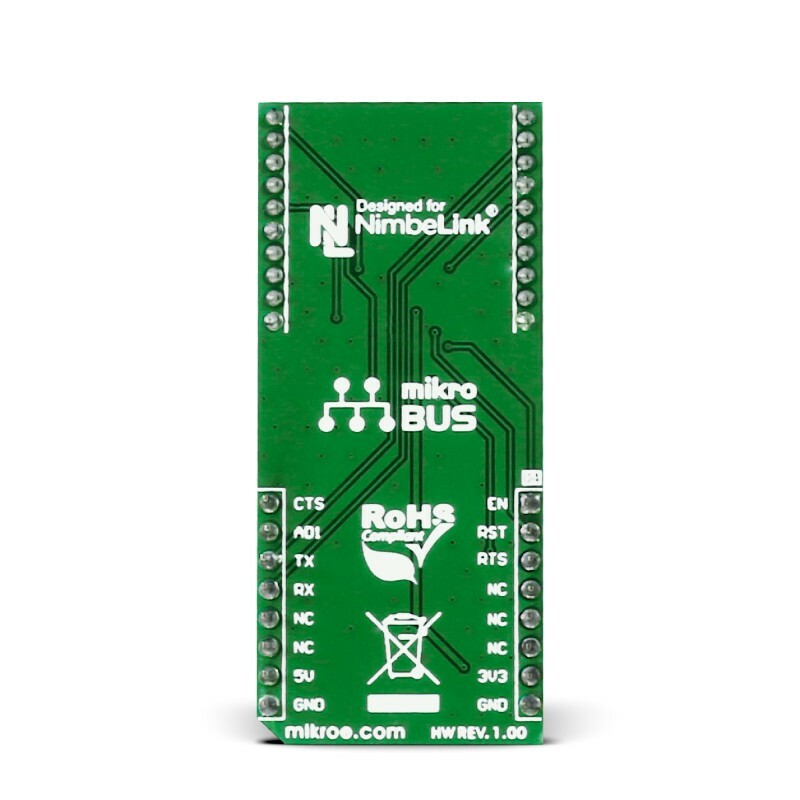 The click communicates with the target MCU over UART interface, and the following mikroBUS™ pins: PWM, AN, INT, RST, CS. NOTE: the Skywire™ modem and the Thermo 3 click are not included in this offer. Skywire™ click has the capability to host an additional mini sized click board™. It also has its own power supply to make the needed voltage for the modules. 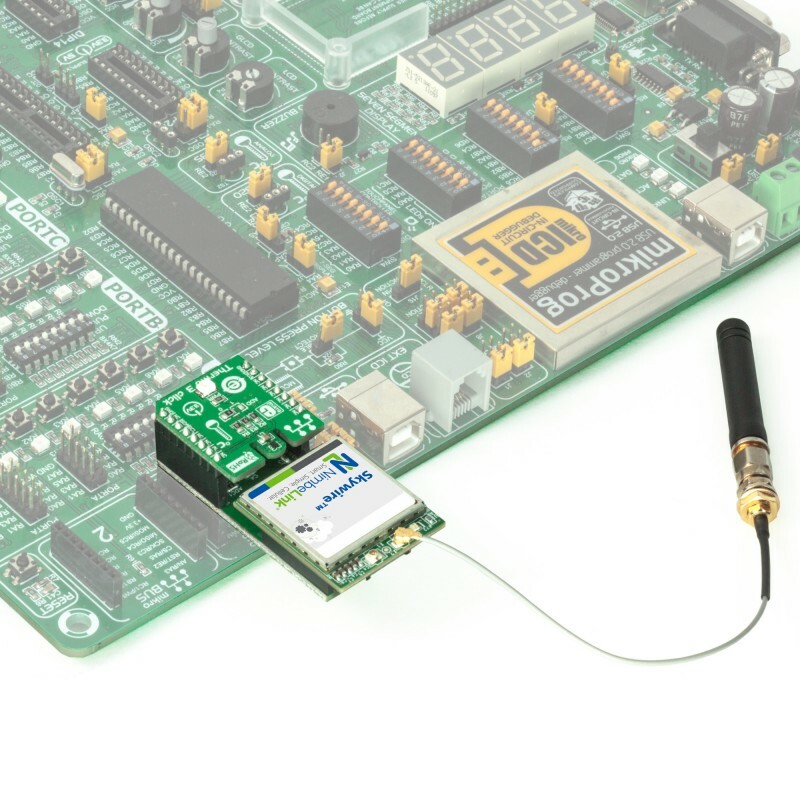 Skywire™ cellular modems are the smallest on the market today. This product family from NimbeLink covers everything from 2G and 3G to LTE. They all share the same footprint and pinout, and are flexible for implementation. This table shows how the pinout on Skywire click corresponds to the pinout on the mikroBUS™ socket (the latter shown in the two middle columns). The following table describes the functions of the onboard jumpers. Code examples for Skywire click, written for MikroElektronika hardware and compilers are available on Libstock. The following code snippet starts the main function in the Skywire application. This is a simple main function, which excepts a call and replies with an SMS to caller. The content of the SMS is the current temperature measurement in degrees Celsius.